LAST YEAR they raised a national ruckus when they unveiled the controversial sculpture that religious-minded critics dubbed the "Door to Hell." Indeed, the piece is so controversial someone vandalized it this week. So what do Sebastopol sculptor Ron Rodgers and his teammates--fellow sculptors Tom Montan, David Hamilton, and Ralph Carlson--have up their diabolical sleeves for this year's Sculpture Jam? Nobody's giving out artistic specifics, but in the wake of new rules imposed on public art by the city of Sebastopol, the team members appear to have revolution on their minds. "With the formation of a review, the Sculpture Jam event has become too convoluted with too many rules," says Rodgers. "This a protest!" The annual Sculpture Jam weekend event, touted by organizers at the Sebastopol Center for the Arts as the only one of its kind in the world, features several teams of artists creating sculptures in public. Community members get to watch the sculptors in action and maybe even participate in the artistic process. The resulting sculptures are then installed on public sites throughout Sebastopol--a fact that caused more controversy last year than anyone ever expected. This year Rodgers and his team have defied Sebastopol's newly created review process. The team has refused to reveal any details about its project, submitting merely a blank sheet of paper to city officials and claiming that they're waiting for "the muse" for inspiration. What this means in practical terms is unclear. "This team's work will probably have to go through the design review board after it's completed," says City Planning Director Kenyon Webster. But the symbolic point is clear. The sculpture team's action is, of course, a blatant swipe at what Rodgers dubs "typical bureaucracy." The group is shunning the procedure that now requires artists to show their designs and get city and community approval for their placement during the Sculpture Jam event, now in its third year. "I used to like the grassroots, hands-on part of the event. These pieces of art are gifts to the city," says an irritated Rodgers, who designed the now infamous door. "The city should be receptive and grateful instead of dictating what can go where." Door Damaged: Vandals attack the so-called 'Door To Hell' with a sledgehammer. THE NEW REVIEW process began this year after controversy arose over the placement of the untitled door sculpture on a grassy berm at the corner of Bodega and Jewell avenues near a local church. The 3,000-pound concrete sculpture depicts a life-size door, slightly ajar and lying like a tombstone on the ground. Some critics interpreted the piece as a diabolical door to the underworld. Other onlookers placed everything from wreaths to restroom signs on the problematic portal. The new city guidelines specify that the placement of art on any particular public site is as significant as the art itself. Therefore siting should be considered "early in the process." Also, the agreed-upon guidelines for placement on a particular public site should provide for the participation and comments of those who will have to "live with" any piece placed there. The new guidelines have produced quite a bit of comment. Not all of this year's Sculpture Jam artists agree with Rodgers and his group. "This is in no way a censorship," says sculptor Susandra Spicer. "It's about whether sites are appropriate for placement of the pieces." She adds that working with the city of Sebastopol was a positive experience. "All the artists have mixed feelings about the red tape because we are a free-spirited bunch," agrees Sebastopol stone and metal sculptor Aaron Poovey. "But the city has been really understanding and responsive." Spicer says she suspects the Rodgers team is purposely not seeking installation approval in an attempt "to be colorful." It's no secret that Rodgers and company enjoyed a lot of the attention from last's year's piece--so are they in it this year to create a little shock value? Teammate Tom Montan says the group is made up of serious artists who are not trying "to be racy." But hearing Rodgers talk, one might draw different conclusions. "We're using the muse as an excuse. If she shows up, we'll have a good piece. If she doesn't . . . well then, it's not our fault," says Rodgers, somewhat ominously. So, is Rodgers saying the team plans to top the public forum and controversy stirred up by the door with their mysterious piece, so far known only by its title, A Shrine to the Muse? "Chances are good that [A Shrine to the Muse] might be controversial," Rodgers admits. "But I don't think it will get the attention of the door." Of course, this year's Sculpture Jam theme, "Totems, Shrines, and Icons," also seems to be purposely provocative. "The theme is like a can of worms--it can be offensive to everybody," agrees Rodgers. Then he adds, "But I don't think anyone's planning that. But if drama happens, it's good. Any publicity is good because the [Sebastopol Center for the Arts] needs monetary donations." But according to Linda Galletta, executive director of the Sebastopol Center for the Arts, which sponsors the Sculpture Jam, organizers are not trying to make the event controversial. "[The door] put us in the spotlight, but controversy is in the eye of the beholder," says Galletta. "The door was actually a traditional Victorian piece, and we didn't expect controversy. I don't think that's the intention of the program. It's supposed to be an educational showcase and a way for artists to come out of their caves and network." Meanwhile, other artists have grown weary of the door and all the histrionics it created. 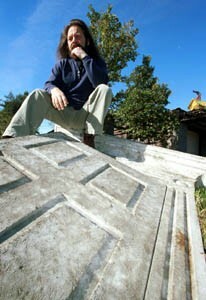 "It's just a door," sighed Sculpture Jam founder Warren Arnold during last year's event. "We've got 11 pieces up around Sebastopol, and this is the only one that's gotten any comment." "The door was the least detailed, the least people-involved piece," observes Spicer. THIS YEAR Spicer and her teammates will assemble a 4-foot-wide, 7-foot-tall wooden altar "to honor the west county." They're asking the public to help decorate it with plastic found objects. Other teams will create a wide variety of items: a forest of totemlike "spirit poles"; a copper fountain made with jewelry; a stone carving incorporating the yin and yang symbol; and large, decorative woven-wire baskets. There's even a new unofficial Sculpture Jam website (www.sculpturejam.org) created by one of the participating artists. Rodgers and his team plan to sculpt their secret piece along with everyone else and wait to see how it's received and whether it can be installed. "The city will probably take a look at it and say they can't find a place for it," says Rodgers with a short laugh. Whether any of the sculptures will cause the same kind of disturbance as last year's door is anyone's guess. But most agree the attention was advantageous. "We made national news last year," reflects Poovey. "Money can't buy that." Sculpture Jam kicks off with an art show on Thursday, Oct. 5, at 6 p.m. that will feature works of art by the participating sculptors. The "jam" itself starts Friday, Oct. 6, and runs through Sunday, Oct. 8, from 10 a.m. to 5 p.m. each day at the former lumberyard on Petaluma Avenue across from the downtown plaza in Sebastopol. Free. Call 829-2416. From the September 28-October 4, 2000 issue of the Sonoma County Independent.